The punk movement in the United States took place almost entirely in the north. 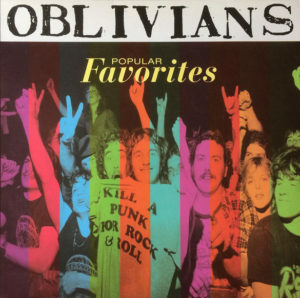 Drawing on the primitive rock of Detroit’s The Gories, Oblivians represented probably the south’s best contribution to punk-inspired rock. Popular Favorites is perhaps the band’s defining statement. The guitars are loud and crunchy. The rhythms are relentless. The lyrics are visceral piss-takes on the travails of a broke working band trying make a living, find romance, come to terms with their place in the world, and maybe also popularize some dance moves. Everything still sounds great more than two decades after it came out. The best cuts tend to be those with Greg [Cartwright] Oblivian on vocals. This album is now out of print but is available for streaming.